Many phone and tablet manufacturers 'skin' Android, including the keyboard, in order to differentiate themselves, and it can be tricky to get used to them if you are swapping brands--unless, of course, you root your phone and install a stock version of Android. But if you have a Samsung TouchWiz-skinned phone or a HTC with the Sense UI, you don't need to go to any more complicated steps now to get a simple and functional keyboard. Just heading to Google Play and downloading the stock Android keyboard replaces the manufacturer-customized keyboard. Google Keyboard for Android comes with all the bells and whistles you would find on a Nexus device. This includes gesture typing, where you drag your fingers across letters and lift it to finish a word. The preview of the word floats above the keyboard as you type, and it will also try to guess the next word you are typing. Also available are dictionaries for 26 languages. You can also use your voice to type with Google Keyboard. You press the microphone button and speak; Google's servers will translate that into words, as long as you don't have a strong accent. The features in Google's keyboard app are not unique though, as they only appeared with Android 4.2. 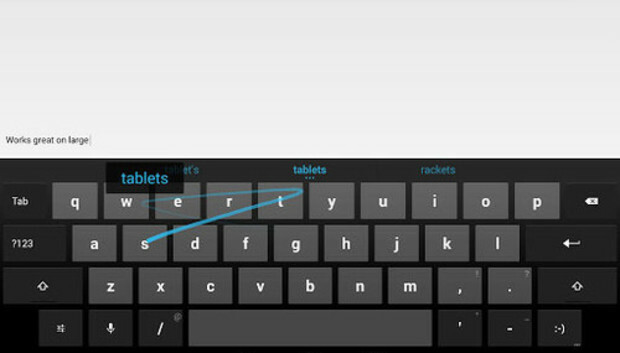 Swype is another popular keyboard app with a drag-to-type feature and dictation. The app was in beta for almost three years but earlier in April the app graduated from beta and now costs $1. Another alternative for gesture-based typing is SwiftKey Flow, which lets you write whole phrases without lifting the finger from the screen. For this, it has to figure out where spaces may have been missed across multiple words of sloppy typing--so "lijwrjis" gives you "like this" in the prediction bar. SwiftKey supports up to 60 languages and multilinguals can juggle between three at a time. SwiftKey also has simple free versions, but full-featured smartphone and tablet versions are priced from $4.